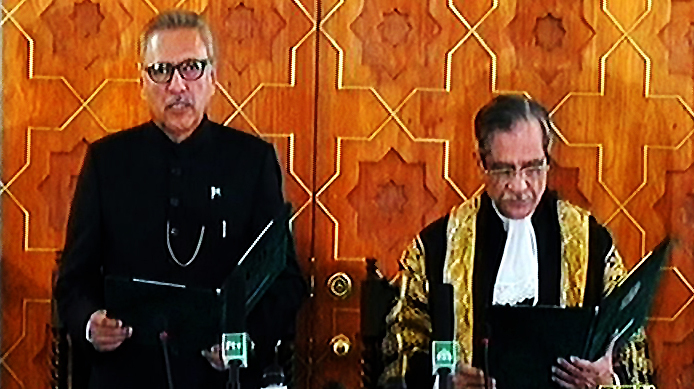 ISLAMABAD:(APS) Dr Arif-ur-Rehman Alvi took oath as 13th President of Pakistan at a graceful ceremony in Islamabad today. Senior political leaders have described the completion of democratic transition of power, after Dr. Alvi was administered oath of office today, as historic. They were recording their impressions exclusively to Radio Pakistan on the occasion of oath-taking ceremony of the President at Aiwan-e-Sadr today. They expressed hope that the government will now be focusing on the challenges facing the country after completion of the transition of power process. Those who spoke included senator Faisal Javed, Punjab Governor Chaudhry Sarwar, Punjab Chief Minister Usman Buzdar, Balochistan Speaker Abdul Quddus Bizenjo, Federal Minister for Investment Muhammad Mian Soomro, Azad Kahsmir President Sardar Masood Khan, and Usman Dar.